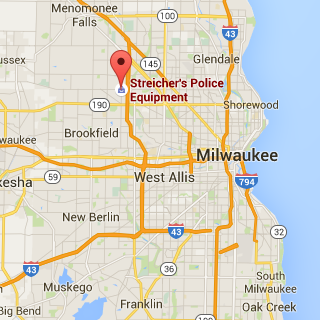 Located just west outside of Milwaukee in Butler, WI, Streicher's Milwaukee has been serving Wisconsin for over 50 years. Conveniently located close to both Madison, WI, as well as within easy driving distance of Chicago, IL, we'll prove to you that the drive is well worth it for the sheer selection and amount of police equipment available. Head west out of Milwaukee on 94, then north on 41 into Butler, you can't miss us! Streicher's Milwaukee is open to the public! Stop in anytime to find the latest apparel, footwear, and gear for the tactical and outdoors enthusiast. Not everything we carry can be sold to the general public, but the vast majority of products we carry are available to any profession or enthusiast. Looking to make an appointment for uniform or body armor fitting? Email us at [email protected] today, and we'll get back to you shortly with estimates.